The Russian Soyuz reached orbit 20 minutes after a flawless launch. Check out details of MESSENGER’s third flyby of Mercury (yesterday at 2:55 PM Phoenix time) on its way into orbit in 2011. The latest Mars Rover mission updates. Opportunity has put 17,717 meters on its odometer (11.01 miles). Russia is set to launch the Soyuz rocket with Expedition 21 tomorrow, 30 September 2009. Watch live coverage with the launch at 07:14:45 UTC (14 minutes past midnight Phoenix time, Wednesday morning). The Japanese HTV supply ship has delivered two experiments from the U.S. Naval Research Lab to the International Space Station. The LCROSS lunar impact target has been changed. NASA changed the target to due to new hydrogen measurements from LRO. Stephen Hawking called for a massive investment in establishing colonies on the Moon and Mars in a lecture in honour of NASA’s 50th anniversary. He argued that the world should devote about 10 times as much as NASA’s current budget – or 0.25% of the world’s financial resources – to space. The Ares I processing continues toward a 27 October 2009 launch. Descriptions of progress and problems can be seen here. For a very detailed view of the lunar surface from the LRO mission, check out this image. Testing the Robotic Luna Lander at the Marshall Space Flight Center. Now that there is evidence for water on the Moon, how do you harvest it? David Shiga at The New Scientist discusses methods. An article in the Orlando Sentinal discusses a new GAO (Government Accounting Office) report that the Constellation Program is poorly managed, suffering from unsolved technical problems, and over budget with no way to estimate total costs. Check out the current scuttlebutt on the 2009 Space Elevator Games. For the space geeks interested in the Space Shuttle Program (SSP), wander off to the inner workings of maintaining the SSME’s (Space Shuttle Main Engines). The New Scientist has a photo gallery of six of the world’s 150 known impact craters, starting with Manicougan Crater in Canada. It is about 200 million years old and one the Earth’s oldest known impact craters. David P. Page, Matthew R. Balme and Monica M. Grady have an article on “Dating martian climate change“, published online in Icarus. Fifty years ago this week, Nature published a paper by G. Cocconi and P. Morrison outlining the search for extraterrestrial intelligence (SETI) by radio telescope. Wayne Hale takes up the issue and reality of commercialization of crew launch to LEO. And juxtaposes it to the air mail experiences in the 1920’s and 1930’s. Russia has postponed its Mars sample return mission until 2011. Planetary Society writer Emily Lakdawalla confirmed that Russia’s space agency, Roscosmos, has said that integration testing will not be completed in time to meet the October 2009 launch window. Bruce Betts writes about The The Planetary Society’s LIFE experiment, which is scheduled to fly on that mission. Space Shuttle Discovery has returned to the Kennedy Space Center in Florida. 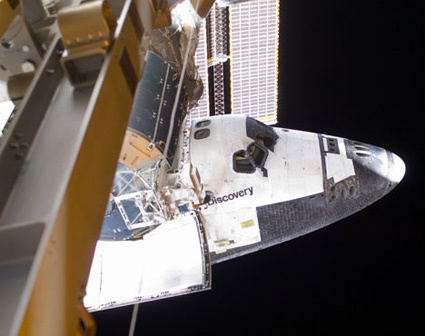 Discovery is scheduled to launch again on 18 March 2010 as STS-131 to resupply the ISS. A NASA news conference scheduled for Thursday concerns a report in this week’s issue of Science magazine that there is a lot of water on the Moon. The results are from the Moon Mineralogy Mapper (M3) aboard Chandrayaan-1. Curious where the Lunar Reconnaissance Orbiter is at the moment you are reading this? Here’s the map. The conference on Asteroid-Comet Hazard – 2009 is in St Petersburg, Russia this week (21-25 September). Discovery departs Edwards Air Force Base on top of its special 747 transporter. SOHO captures Saturn’s annual pass behind the sun. The Cassini spacecraft accompanies Saturn, its rings and moons. Comments about the Japanese HTV arrival at ISS: “It’s a real example of international cooperation with a Japanese vehicle captured by a Canadian arm with American and European astronauts and a safety guy from Canada and under the command of a Russian commander,” said Frank De Winne, a European astronaut serving as flight engineer. The Commercial Spaceflight Federation is pleased to announce its co-sponsorship of the Next-Generation Suborbital Researchers Conference (NSRC), which is being organized in conjunction with the Southwest Research Institute (SwRI) and the Universities Space Research Association (USRA). 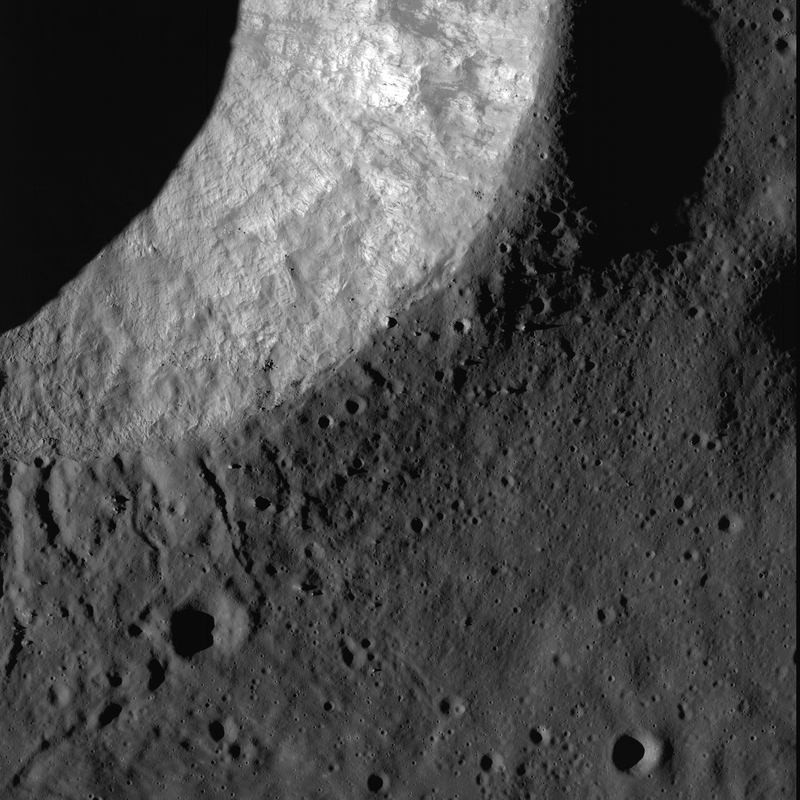 The latest LROC image release. The Russian Soyuz-2-1B successfully put the Meteor weather satellite and other instruments into their proper orbits. On the International Partner (IP) front, the Japanese HTV arrived at the ISS Thursday. The HTV is capable of delivering six tons of pressurized and unpressurized cargo. From the Times of London (and many other sources) we have news from the European Planck Observatory about “radiation from just 300,000 years after the big bang and could give the clearest picture yet of what the Universe looked like just after its formation”. Obama nominates Elizabeth Robinson as chief financial officer for NASA. NASA’s last clean audit was 2002. Live Video of Soyuz-2-1B launch of the Meteor M satellite. Replay is here. So, can Russia bail out the US with the 20 year old (mothballed) Buran program? The launch of a Soyuz 2-1B rocket has been postponed until tomorrow due to bad weather. JPL is continuing efforts to free the Spirit rover from the deep soft soil at the sie on Mars called “Troy”. Discovery is safely at the Dryden processing facility at Edwards Air Force Base awaiting transportation to Florida. Welcome home. Mr. Norman Augustine, Chair, Review of U.S. Human Space Flight Plans Committee, Vice Admiral Joe Dyer USN (Ret. ), Chair, Aerospace Safety Advisory Panel, NASA, and Dr. Michael Griffin, former NASA Director, are scheduled to testify tomorrow before the Committee on Science and Technology concerning the report of the “Review of U.S. Human Space Flight Plans” Committee. The LCROSS Observation Campaign has a group on Google Groups. Follow along with the amateur astronomers working in conjunction with NASA. Watch the successful flight of the Armidillo Aerospace Lunar Lander Prototype on Parabolic Arc. Doom and Gloom headlines from observers of the Augustine Commission Summary Report. DrDave disagrees. Watch for News. Discovery returned successfully last night. Armadillo Aerospace made two flights of its lunar lander prototype today, putting it in the lead position to capture the Northrop Grumman Lunar Lander Challenge. NASA has released a large collection of new photographs from Hubble. Check out the Butterfly Nebula and other images. Discovery is scheduled to land in Florida at 4:05 PM Phoenix time. The Hubble Space Telescope is back in service. First photographs have been released. NASA image of the Station Fire in Los Angeles. 251 square miles have been burned. The 365 Days of Astronomy podcasts have won a Parsec Award. Images of the the ISS and Discovery together from the Earth. The Augustine Commission’s Summary report has been delivered to NASA and the Whitehouse today. STS-128 saw the Leonardo Multi-Purpose Logistics Module (MPLM) returned to Discovery’s payload bay and the hatch closure between the ISS and the orbiter. Discovery will undock today. The Times of India reports that the lunar orbiter Chandrayaan was killed by heatstroke. Florida middle and high school students have been invited to a competition to design scientific experiments to send to the Mars Desert Research Station (MDRS) in Utah. The contest is sponsored by Space Florida, The Mars Society, NASA-Kennedy Space Center and the Florida Department of Education (DoE). The Space Shuttle Discovery will complete packing up in preparation for undocking today prior to its return to Earth. LROC released the 11 August 2009 NAC image of the Apollo 12 landing site. It is about 1/3 from the top on the far left of the image. See the LRO Apollo 12 site with annotation on Wikipedia. The third and final spacewalk of the STS-128 mission is scheduled to begin at 1:49 p.m. PDT today, Saturday. The indonesian telcom satellite Palapa-D, stranded short of its intended Geosynchronous orbit 36,000 km above the Earth by a third stage anomaly of the Chinese Long March 3B rocket, will be salvaged. It should be in position by mid-September and be able to serve 8-10 years of its intended 15 year life. The LCROSS team has rescinded their spacecraft emergency declaration regarding propellant loss, according to a NASA memo from Daniel Andrews, Project Manager, LCROSS. Mars Reconnaissance Orbiter suffered fourth reboot of the year, and is now in “Safe Mode” awaiting engineering analysis. SpaceX signs contract to launch 18 Orbcomm communication satellites.